This Tyrannosaurus Rex that stands in the town of Drumheller in Alberta, Canada is the largest model in the world of a dinosaur. When you visit the town of Drumheller, you can not miss the large model of a Tyrannosaurus Rex which is just the beginning to the wonders found at the Royal Tyrrell Museum of Palaeontology in Alberta, Canada. Not only does this Tyrannosaurus Rex tower over the buildings but you can climb the stairs inside the dinosaur and peer out over the region from behind the teeth of this massive T. Rex model. Town of Drumheller. 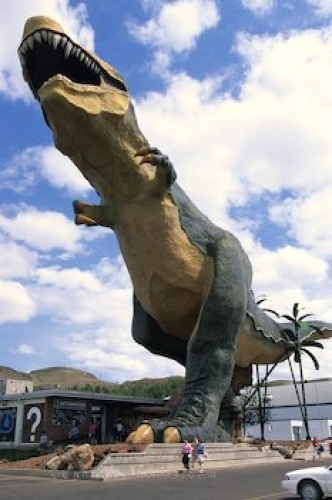 A large model dinosaur in the Drumheller Valley of Alberta in Canada. Picture of a Tyrannosaurus Rex outside the Royal Tyrrell Museum in Drumheller, Alberta.